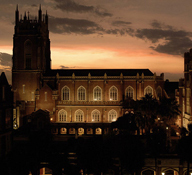 Loyola University New Orleans seeks support from alumni, parents, friends, private foundations, corporations, and organizations to meet university needs. The Office of Development in Loyola’s Office of Institutional Advancement is charged with the task of raising funds for the university from private sources. Loyola’s fundraising priorities are determined by the president, the Board of Trustees, the provost, and the vice president of institutional advancement. Lasting gifts to Loyola University New Orleans benefits students and professors, but also improves lives in New Orleans and throughout the world in light of Jesuit ideals of truth, wisdom, justice, and beauty. provide a permanent source of funding for first-generation college students or reward the talent and hard work of outstanding scientists, literary scholars, and student-athletes. partner with young entrepreneurs or support the mediation work of attorneys-in-training. participate in the creation of beauty by musicians, artists, and actors. Read more about fundraising opportunities on our Giving website.